NIMBioS is co-sponsoring this seminar with the Howard H. Baker Jr. Center for Public Policy as part of the Interdisciplinary Discussion Forum on Energy and the Environment. The program is free and open to the public and will be archived online on the Baker Center's Multimedia page after the event. Time/Date: Thursday, September 15, 2011, 3:30-5:00 p.m.
Speaker: James Sanchirico, Environmental Science and Policy, Univ. of California Davis. Abstract: A scientific consensus is developing on the need to transform marine and coastal management to a more holistic ecosystem-based approach. The presentation will investigate the economic and ecological gains from expanding the scope of management objectives in two related systems. The first analysis utilizes a multispecies bioeconomic model for a Caribbean coral-reef ecosystem to determine the optimal ecosystem-based fishery management (EBFM) harvesting rates for both predator and prey species. The analysis focuses on how this more comprehensively optimal management differs from traditional approaches and how predictions change when the objective of management is expanded to include a non-consumptive value of a prey species (Stoplight parrotfish) and the predator (Nassau grouper). 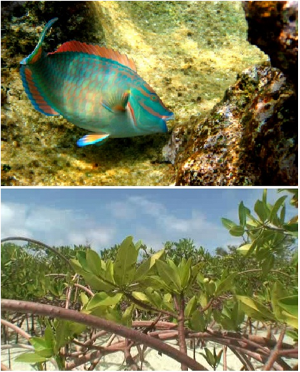 The second analysis investigates the economic and ecological implications of habitats providing multiple ecosystem services, using fish dynamics in a coupled coral reef-mangrove-seagrass environment as the model system. The analysis develops ecosystem-service trade-off curves, finds the optimal locus on the curve, and illustrates how management might achieve the optimum. Special attention is paid to how these solutions and potential payments for ecosystem services depend on the nature of the species-habitat linkages and on the scope of the coastal planner's objective.